HEAR THE ELECTRIC VIOLINIST SOON! Joanna is delighted to have been invited back to play for Land Securities at their Zig Zag building in London on Friday 16th December. The performance is from 12:00 pm until 2:00 pm. Pop along and listen to some festive tunes! In December Jo was lucky enough to be invited to Jeff Wayne's studio in Hertfordshire to record with the latest Yamaha Silent Violins for the upcoming West End production of War of the Worlds. It was a very exciting day, and lovely to meet Jeff in person. The most explosive, fresh and exciting string act sensation. A red hot act with electrifying violinists, graduates from renowned music conservatories that have performed across the globe, astounding audiences with their spectacular show.Hear them live at Eastbourne Bandstand on 12th July 2015. More information HERE. A fantastic new tune - hear it here, hear it now! Follow the link, click to LISTEN! I've created some fantastic new tracks by Britney Spears, Joan Armatrading, the Bee Gees, Bruno Mars and JLO. 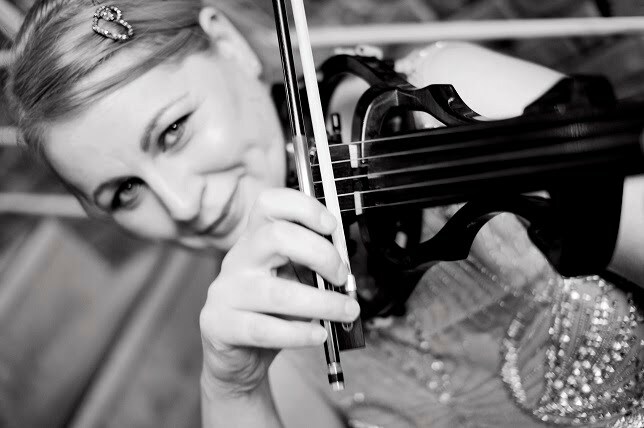 With a raunchy, more 'electric' sound to the violin, these tracks will give your event pizazz!! As part of your Ceremony Package why not ask me to arrange yours and your partners special song for me to play whilst he is waiting for your grand entrance! A unique and romantic way to show your partner that you love them. Joanna is very pleased and excited to announce that she is once again playing for the brilliant Latin American dance couple Sergey and Melia as part of 'BDF Night of 100 Stars'. The best dance couples in the world are taking part! It is on 10th. October 2011. and tickets are available at www.bdfonline.co.uk. Joanna is soon to start recording her first C.D. It will feature Classical Favourites, Jazz, Popular Music and original compositions. Joanna was very honoured to be able to play violin for two magnifcent Latin American Ballroom dancers, Sergey Surkov and Melia, at the prestigious Blackpool Dance Festival held in the wonderful Winter Gardens. This was definitely a career highlight! The event was recorded and the DVD will be on sale soon. Watch this space for You Tube clips of Joanna and the dancers.